Windows Defender is the antivirus program that cones built-in to Windows versions 7 and 8. Some people claim it is not an enterprise capable antivirus program, but it does a good job of protecting most users, and it comes bundled with the OS for free. Windows Defender cannot do a complete job of scanning malware on your PC because in the GUI (Graphical User Interface) mode, some core operating system files are in use. However, you can set Windows Defender to perform an offline scan before it loads these core operating system files. Offline mode also makes it easier to detect highly persistent malware like rootkits. To run Windows Defender in offline mode, open Windows Defender and click on the gear icon to open its settings screen. 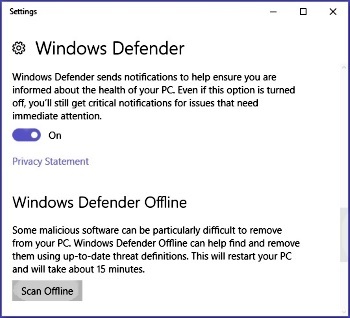 On settings screen, near bottom of right panel, under the title "Windows Defender Offline", click on the [Scan Offline] button. Your PC will then restart with no GUI, perform an offline scan, and then boot back into GUI mode. To see the results of the offline scan, open Windows Defender select the History tab, and click on the [View details] button.